With Saint Patty’s Day coming up early next week, I think it is always fun to participate in some kind of holiday crafts or in this matter, baking with your kids. Since the theme of this holiday is the color green I thought of making something green but also wanted to make something healthy. If you follow our blog you know that I am a big fan of hiding veggies in kid’s foods to help them get their daily intake. I immediately thought of muffins for this holiday because it’s one of my son’s favorites! 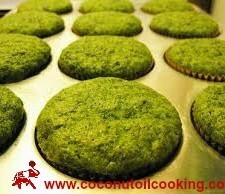 I decided to make a spinach muffin as it is full of vitamins and fiber. I masked the “boring” flavor with some cinnamon and bananas to make something delicious. Preheat oven to 350 degrees F and line two 12-cup muffin papers with liners. In a large bowl whisk together flours, sugar, baking powder, baking soda, cinnamon , and salt. Set aside. Add oil, milk and spinach to blender. Blend on high for about 30 seconds or until completely pureed. Add banana and vanilla and blend to low, just to mix. Pour pureed mixture into your dry ingredients and fold together until completely combined. 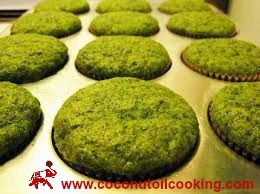 Fill each muffin liner about 2/3 full and bake for about 18 to 20 minutes or until a toothpick entered into the center comes out clean. This is a really simple recipe to make and honestly tastes so delicious. I enjoy these muffins because they arent too sweet and I’m getting a great source of healthy fats, fiber and iron into my diet which is great for pregnancy. The muffins were a total success with my two-year old as well, which is always an added bonus! What are you favorite Saint Patty’s Day recipes?